Journalists on ground to cover a protest in Ilesa, Osun State, over the disconnection of electricity supply to the town have been attacked with cutlasses. The protest began on Sunday evening, and lasted through Monday. Marching through the streets, the youth barricaded the roads and prevented motorists from passing through, berating the Ibadan Electricity Distribution Company (IBEDC) for cutting off power supply to the area. Journalists covering the protest on Monday were attacked with cutlasses and other dangerous weapons, while their recording equipment got damaged. Rafiu Muhammad of Television Continental (TVC) and his cameraman, Taiwo Adu, as well as Shittu Abdulfatai, a Channels Television reporter, and his cameraman, were attacked and their cameras destroyed. The journalists are receiving treatment at the Ladoke Akintola University Teaching Hospital in Osogbo, the Osun State capital. On March 14, some youth from Olomilagba and Bolorunduro communities in Obokun Local Government Area of the state had stormed the Ilesha business hub of IBEDC to protest “crazy bills”. During the protest, the IBEDC management claimed that the youth attacked their staff and made away with money. 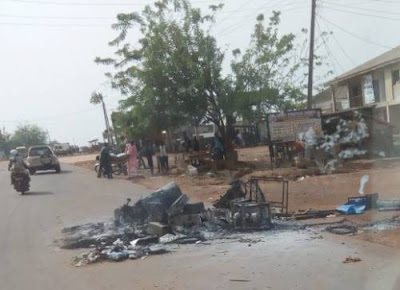 As a result of the attack, IBEDC disconnected electricity supply to the communities, which led to the violent protest. At the protest, which resumed on Monday, the youth allegedly vandalised the IBEDC office in Isare, Isokun and Oke-Omiru in Ilesha. Office documents as well as other valuables of the company were allegedly set ablaze by the protesting youth. Folashade Odoro, the Police Public Relations Officer in the state, said policemen had been deployed to the town to address the situation, and appealed to residents to go about their lawful duties without fear of intimidation. Kikelomo Owoeye, the IBEDC Regional Communication Officer, confirmed the disconnection of power supply to the area, noting that the management of the company was already meeting at its headquarters to decide the next line of action. According to Owoeye, the disconnection of electricity to the communities was to safeguard the lives of IBEDC staff.